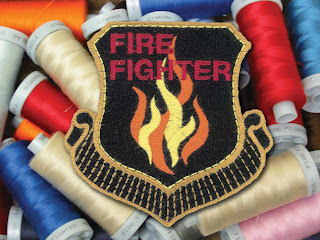 Looking to add another creative touch to your embroidery projects? 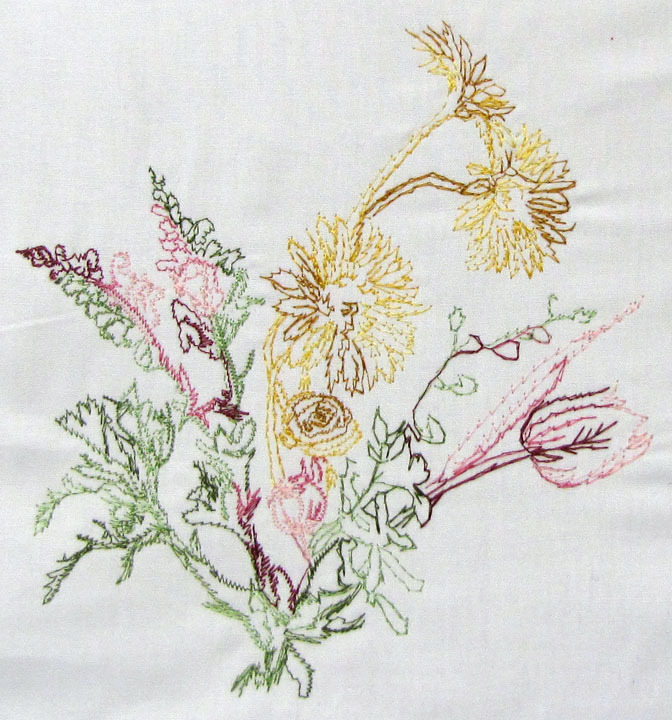 How about trying your hand at appliqué? Appliqué is a technique in which pieces of fabric, embroidery, or other materials are sewn onto another piece of fabric to create designs, patterns or pictures. 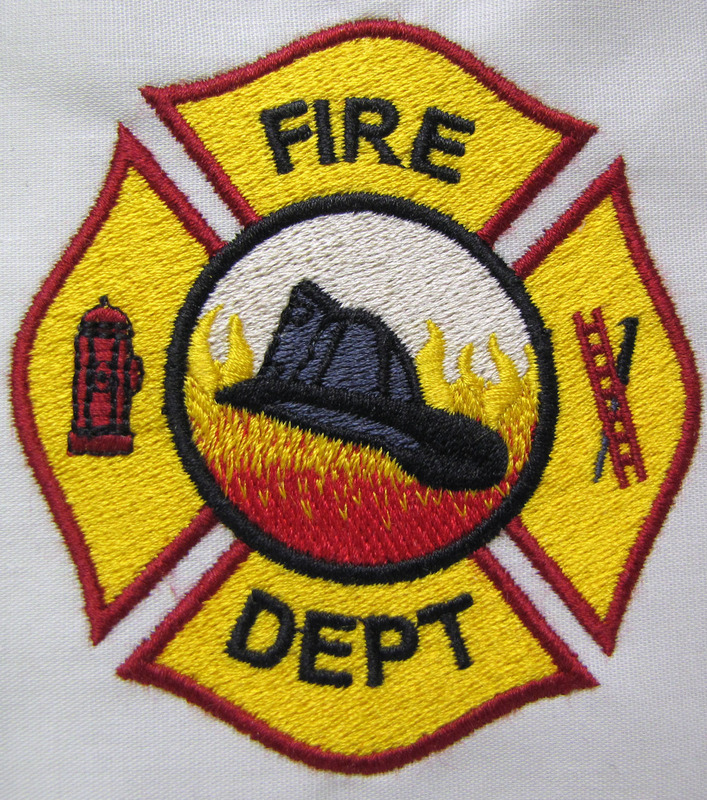 Appliqués personalize your embroidery with your favorite fabrics, prints, and patterns and offer an unlimited number of looks and textures on an embroidery design while reducing the stitch count. Insider Tip: All appliqués must be backed with a Heat Seal or Fusible backing. This forms a bond between the base fabric and the appliqué to keep the two fabrics from shrinking and causing the design to pucker. Calling All Fashion Mavens! Are You On Trend? Keeping on top of the latest trends is no easy task! Madeira's here to help with our Trendspotting page. We've created a page on our madeiramart.com site highlighting the upcoming trends in fashion for all our fashion savvy customers. Visit our Trendspotting page often for Thread Kits that will keep you on top of fashion trends and able to offer colors and special looks that will set you apart from the competition! What's the big trend for Fall? Color Blocking, or, the use of large blocks of big, bold color, often coming from opposite sides of the color wheel, is the trend into early Fall, with some fashion experts predicting it will run through the rest of 2011. Prefer a matte look to your color blocking? We've also created a Color Blox kit with our Frosted Matt just for you! For additional information and to order, visit madeiramart.com. Think Color! Color! Color! Be Bold! Often times, it's the really big companies that reap the benefits and savings due to volume. At Madeira USA, we appreciate all businesses, whether you're a single head company or 500+ head company. Which is why we were the first in our industry to implement a customer appreciation program (CAP) specifically geared to those of you who may not already receive discounts. Just because you're not a huge company doesn't mean you shouldn't be entitled to also cashing in on some savings too! We our customers. So, what is our Customer Appreciation Program? 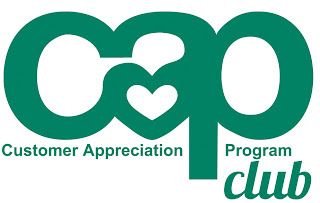 Madeira's Customer Appreciation Program (CAP) is our loyalty program - where the more you spend the more you earn in savings. Goals are individualized and based on what you have spent in the past. You can learn your individual goal - and how many reward dollars you are entitled to once you reach your goal in sales dollars - by calling 800 225-3001 or by visiting madeirausa.com. New for 2011, we've revamped our CAP program by adding additional program levels to meet various customer needs. To find out more, click here. When it comes to fashion leaders, what have Coach, Ralph Lauren and Tommy Hilfiger got in common? They are all featuring an ombré (a gradient dye treatment) look in their current designs. Consider Madeira's fashionable ombré when planning your embroidery this year ~ check out our Tonal Trends Ombré Kits! Madeira has launched a campaign called Tonal Trends in order to satisfy the embroidery needs of the decorated apparel marketplace. 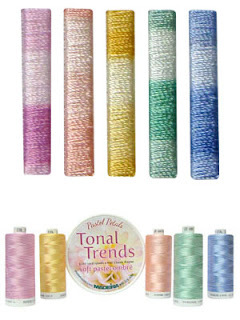 It consists of three kits – pastel, primary and neutral – each offering five 1,100 yard spools of Classic Rayon #40 ombré thread in a sturdy plastic storage jar. Classic Rayon #40, known throughout the world for it's quality and glossy luster, is made of 100% viscose rayon. The 40 weight thread is a general weight thread and perfect for embroidery on most designs on high speed commercial embroidery machines. Did we mention that it's also Oeko-Tex certified? Meaning there's no hazardous materials used in any part of it's manufacturing. So, not only can you be on trend, but eco-responsible too! 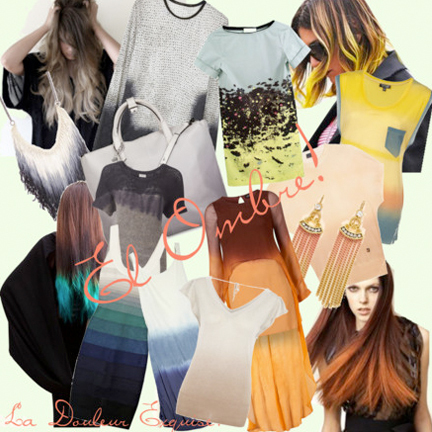 Get creative with our Ombré kits! As safety becomes increasingly significant in the workplace and government regulations become more strict, did you know that Madeira’s Fire Fighter embroidery thread is fire resistant? Meaning it will not continue to burn once it’s removed from the ignition source? Geared toward the protective clothing market, it’s the ideal thread for when safety is a top concern! Striving to be Your One-Stop Shop, Madeira also carries fire retardant Proban® backing, fire resistant E-Zee Weblon Mesh and fire resistant Coats pre-wound bobbins for an all inclusive safety bundle for your convenience. For nearly 100 years, long before being “green” was in the forefront of mainstream social consciousness, Madeira has been setting the world standard for manufacturing and distributing embroidery thread within an ethical and eco-friendly environment. Right from the start, adhering to the principles of Re-think, Reduce, Re-use and Recycle, Madeira maintains its “choice of market leaders” status by taking a position of responsibility and accountability. Raw materials in the production of our embroidery thread are purchased only from accredited sources and hold ISO and/or Oeko-Tex certificates. Efficient manufacturing processes reduces water and energy consumption. Water that is used from the dying process is later purified and returned to the environment. Heat is recycled from other processes for the thread drying system. Financial contributions are made to Unicef, World Wildlife Fund and local causes. Madeira’s embroidery threads are Oeko-tex® certified to be free of all harmful substances. Classic Rayon is made with sustainable resources and is biodegradable, compliant with Global Organic Textile Standards (GOTS) and is the only embroidery thread that is GOTS compliant. Recycling is practiced at all 12 Madeira locations throughout the U.S. and energy consumption is closely monitored. Did you know that the plastic cores that our thread are wound on are recyclable? Our empty cone and spool cores are made of the #5 plastic, polypropylene and are recyclable. Many local communities have a recycling program in place, so check with your local government or city hall to find out if they accept #5 plastics for recycling. Like so many things in life, a successful outcome is the result of many things falling into place or achieving a harmony. 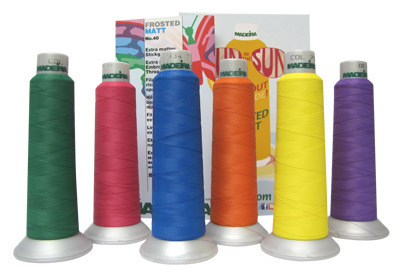 In embroidery, you need the right tension, backing, thread, needles etc. in order to achieve success; it requires a perfect balance. Luckily, with embroidery, this isn’t difficult to obtain, unlike, say world peace? So, we’re going to start off on explaining the difference between needle types. There are primarily two types of needles: Ballpoint and Sharp, which is then further broken down into Round shank or Flat Sided Needles. Ballpoint Needles have a rounded point to prevent cutting into the fabric when embroidering. They’re used for knitted fabrics such as t-shirts, lingerie, fleece, sweatshirt material and finely knit sweaters – basically anything you don’t want a big hole in. Sharp Point Needles have a sharp point to allow the needle to cut through tightly woven fabrics when embroidering. They’re used for twill, denim, canvas, caps and broadcloth – usually any type of fabric that is thick or stiff, which would require more pressure in order to penetrate the fabric. Round Shank needles have a round shank and are commonly used on commercial embroidery machines. Flat Sided Needles are flat on one side of the shank and are commonly used on home/non-commercial embroidery machines. We’ve covered the type of needles to use based on the type of material you plan on embroidering onto, but what about which needle size to use? Depending on the thread weight that you plan to use for your project, that will determine the needle size that you need to use. Below is a chart of the recommended needle for each of our thread weights. Helpful Tip: The smaller the needle used, the smaller the penetration hole. Using the smallest needle recommended for each thread type will give you the optimal, best looking design. 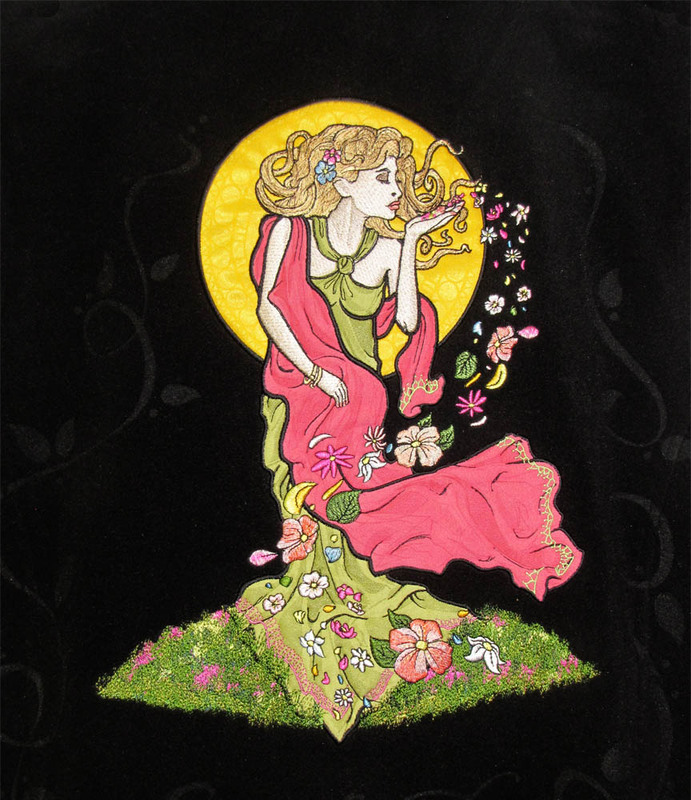 It’s recommended that new embroiderers use the larger or middle size needle recommended. 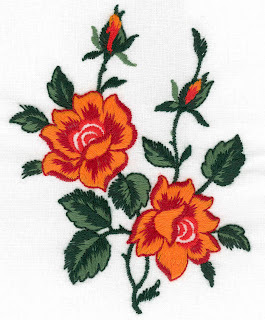 As you gain more experience, moving down to the smaller needle may improve the look of your embroidery. Change is in Bloom at Madeira USA! Exciting news here at Madeira USA! After months of work, we've launched our NEW and IMPROVED versions of our three websites: madeirausa.com, madeiramart.com and ezeebacking.com. The update offers embroiderers easier functionality, more interactivity, a wider knowledge base and improved shopping cart experience. 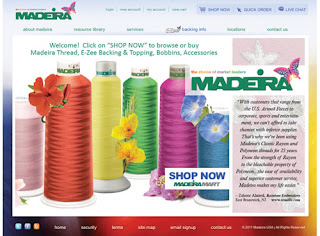 Be sure to check out www.madeirausa.com and let us know what you think, we'd love to hear from you! As we face the winter months with repeat snow storms here in New England, we can’t help but want to surround ourselves with all things warm and cozy. Which is why we are especially inspired to embroider with our wool-blend Burmilana #12 thread around this time of the year. The fuzzy wooliness of Burmilana gives a hand-crafted look on garments and adds depth and texture, perfect for achieving a unique feel to your embroidery – part vintage, part folk art. It is also ideal for use with chenille and chain stitch embroidery attachments. 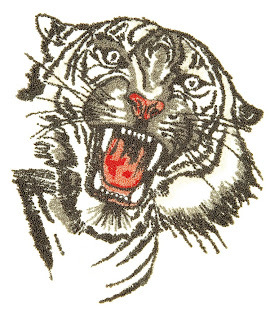 Make sure your design is digitized for a #12 weight stitch density(.9 or 9). A #100/16 large eye needle is recommended. The elongated eye means thicker threads can pass through easier than through standard needle eyes. You may also want to try our Schmetz FHS (Fixed Hook Setting) Needles. They're designed for heavier weight threads and do not require you to adjust the timing on your machine. Remember to clean your bobbin case and rotary area out often. Canned air works great for this. There’s no reason to be afraid of trying a specialty thread, such as Burmilana. With a little know-how, you can achieve amazing results. 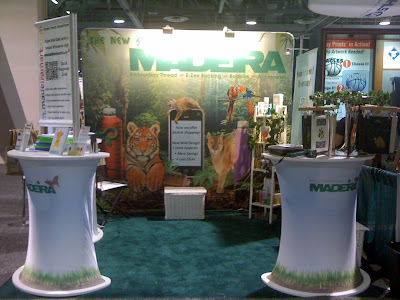 We kicked off the 2011 tradeshow show season with a roar – literally. At the ISS Long Beach Show on January 21 - 23, Madeira unveiled it's new tradeshow booth design – complete with tiger roars and rainforest sounds. 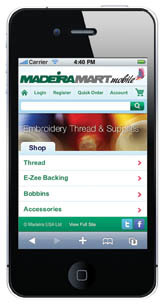 This year's tradeshow booth theme is "A New Species of Shopping" with the launch of the Madeira mobile website and the upcoming web redesign in March. We also continued our commitment to being eco-friendly with re-useable totes given out at the show. ISS Long Beach was a great show and we enjoyed getting a chance to speak with our friends and customers who stopped by. Thank you to everyone that stopped by our booth and hope we see you at future tradeshows this season! 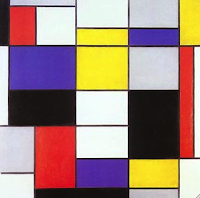 Madeira’s 2011 Source Guide is Here! 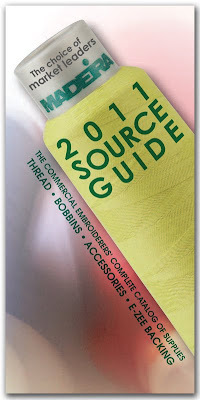 Madeira's NEW 2011 Source Guide, a complete catalog of Madeira's embroidery thread and supplies is now available! Download the electronic copy of our Source Guide online by clicking on the link below and get up-to-date pricing on your favorite products and see what's new! The New Species of Shopping is here at Madeira USA! Don’t know what a QRC is? QRC stands for Quick Response Code. They’re the strange square looking bar code you may have started seeing more frequently in print and online. QR codes encode data both horizontally and vertically in a grid of tiny squares. This allows for much more data to be encoded in a smaller space. QR codes are tailor-made for quick and easy linking to content on smart phones. Most new phones are QRC – ready, meaning they’re able to read the codes right out of the box. If you do not have a QR reader on your phone, you can often download one from your app store. We’d love to hear what you think of the new mobile site!